Defend women’s rights in Albuquerque, N.M.
Women's rights activists, including WORD organizers, packed the Albuquerque City Council on September 16 to denounce the proposed anti-woman ordinance and declare Albuquerque a pro-choice city. Right-wing groups from outside of New Mexico that are part of a campaign to undo women’s rights nationwide have successfully petitioned to place a measure on the ballot for a special election taking place in Albuquerque, New Mexico, on Nov. 19, 2013, that would ban abortions after 20 weeks. The misleading name of the ordinance – “Pain Capable Unborn Child Protection Ordinance” – is an attempt to cover the purpose of the proposed law in lies and language that pulls at the heartstrings. The truth is that this is a blatant attempt to strip Albuquerque women of the right to control their own bodies and make decisions about their health care. This ballot measure is NOT about banning abortions at 20 weeks – it is about taking the first steps in banning ALL abortions, not just in Albuquerque, but nationwide. This is a battle in a larger war on women being waged by the right wing. With each battle they win, they are taking more territory. We cannot cede them any territory. We cannot accept any infringements on reproductive rights. We cannot allow them to roll back the clock on the rights that women fought for and won. Anti-choice groups, like the Legal Life Defense Foundation and Operation Rescue, were unable pass laws at the state-level in New Mexico. This ordinance is a new step, a new tactic, to pull the issue down to the local level. They hope to set a precedent of local bans, with the hope that this tactic will spread across the country and lend itself to helping increase the restrictions on abortion at earlier and earlier stages until what was a right is completely banned for all. We cannot stand by and allow this to happen! One in three women will have an abortion in her lifetime. This is an issue that impacts hundreds of thousands of women across the United States. The bill is part of a larger attack on women’s rights, not concern about late-term abortions. Abortions after 20 weeks account for a little over 1 percent of all abortions in the United States. The overwhelming majority of abortions are performed at much earlier stages, before 13 weeks. The only exceptions granted are to save the woman’s life, or because the pregnancy would cause substantial and irreversible physical impairment to the woman. It would also make it illegal to induce labor earlier if it would threaten the life of the fetus. The right to choose is an issue for poor women who have little other options available to them – NOT the right-wing bigots who put the ordinance on the ballot. The overall unintended pregnancy rate in the United States remained stagnant between 1994 and 2006, but unintended pregnancy increased 50 percent among poor women, while decreasing 29 percent among higher-income women. Multiple studies have shown the enormous burden that is placed on poor and working women who are forced to struggle to come up with the hundreds of dollars required. The average early-term abortion costs $450, only increasing as the pregnancy progresses. Almost 60 percent of women who have abortions later in their pregnancy do so because they were not able to make arrangements and raise the necessary funds earlier. The ordinance is costing the City of Albuquerque hundreds of thousands of dollars and will ultimately cost millions because the ordinance has NO legal basis. The ordinance, if passed in November, will be unenforceable and unconstitutional. With groups already talking publicly about challenging the bill in court should it be passed, the New Mexico Attorney General has stated that the process will be costly for the state when it has to pay for the trial. And where is that money going to come from? From taxpayers as need services are slashed! Fight against anti-woman, right-wing reactionaries who are attacking women’s rights in Albuquerque! Spread the word about the Albuquerque ballot measure! Let your friends and family know why we should all support the struggle Albuquerque because the right wing is attempting to use this tactic nationwide. Help to spread the word about this important struggle to everyone you know in Albuquerque. 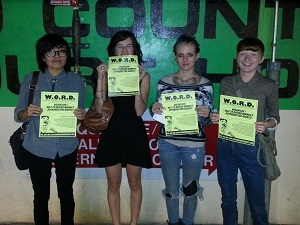 Attend local events in defense of women’s rights. Speak out at Albuquerque City Council on November 18 to demand a resolution that protects women’s reproductive rights. Vote against the November 19 ballot measure that takes away a woman’s access to a safe abortion.